To be honest, the following ancient Finnish small beer isn’t particularly delicious. Some people even think that it is not a beer at all. However, this archaic ale reminds the gruel beers of the ancient civilizations, and thus it is immensely interesting. Today many Finnish canteens and households serve low alcohol small beer called kalja with food. Although kalja is technically a beer, the Finns see it as more like a soft drink and part of an ordinary meal. Homemade kalja do contain little alcohol, usually around 1 % ABV, but it is not regarded as an alcoholic drink. Children may drink it, and it is even served in some schools. This modern kalja is made from dark rye malt, sugar and baker’s yeast. It is very simple to brew with standard cooking skills and kitchenware: mix rye malts, sugar and hot water, let cool, add baker’s yeast, ferment very briefly, and move to cold while still sweet and somewhat unfermented. This one minute video shows all the essential steps (in Finnish, but you’ll get the idea). Also commercial bottled versions exists, but usually kalja is made at canteens and homes. In 2009 few kids started to rival who can drink most kalja at school’s Christmas lunch in Southern Ostrobothnia, Finland. The teachers drank kalja also, but they did not realize that it contained alcohol, neither they noticed that some students were gulping down as many as ten glasses. The incident became apparent only an hour or so later from the staggering walk and nausea of some nine to twelve year old children. One nine year old boy was taken to a municipal clinic, where his blood alcohol level measured one permille (BAC by mass). Today’s kalja is a modernized version of an ancient farmhouse ale made for daily consumption. These ales were part of the diet and drank by everyone. The old brewing practices were hugely diverse and the ales were known under various names besides kalja, such as vaassa and taari, but in the following I will just refer all of them simply as kalja. Sugar in kalja is a modern shortcut for sweetness which in the old days came from malted and unmalted grains. Converting grain starches into sugars is a laborious task, and traditional ways of brewing kalja were in decline as soon as cheap sugar became widely available. Many households were still making kalja without sugar in the beginning of the 20th century, and the traditions are fairly well documented in the ethnographical texts. As far as I know, the original sugarless kalja traditions are now extinct in Finland. Old style kalja did not contain much seasonings. Sometimes juniper branches used as a filtering aid gave flavor, or a handful of hops was thrown into the brew, but often the ingredient list was just malted and unmalted grains, water and yeast. In the East the Karelians of Lake Ladoga sometimes supplemented grains with potatoes. Historically Finland has been at the intersection of eastern and western cultures, and this is clearly apparent in kalja traditions. In Western Finland sahti has been the premium farmhouse ale while kalja was seen as diluted second grade version, manifested in the saying “kalja is for working and sahti is for feasting”. In the west the brewing practices of kalja were similar to sahti, though the daily drink was usually made with cheaper ingredients and less effort. Thus in the west both sahti and kalja relate to the Scandinavian and Germanic brewing traditions. In the west kalja was also made by from the later runnings of sahti, by rinsing with water the residual sugars from malt. However, this was not the main method for brewing kalja, as sahti was mostly brewed for feasts. Historical provinces (or tribes) of Finland. 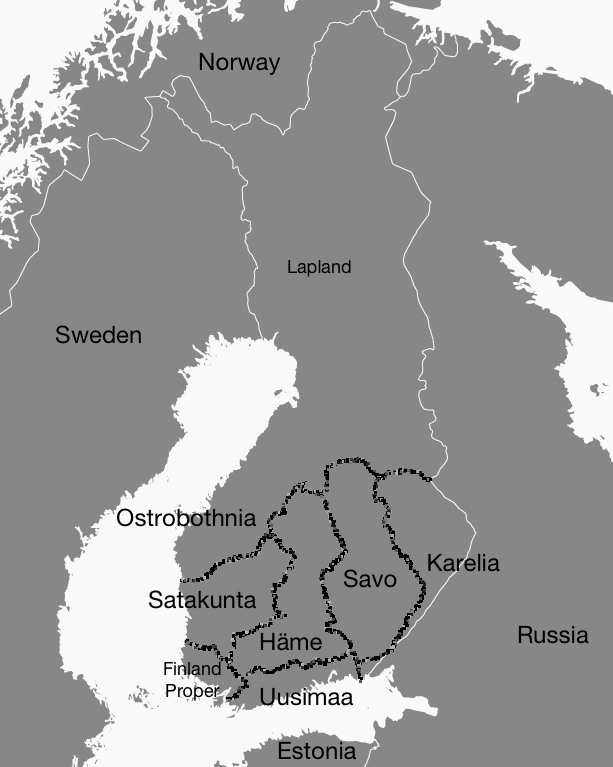 Häme, Satakunta, Finland Proper, Uusimaa and Ostrobothnia were the realm of western sahti and kalja traditions. The eastern kalja traditions thrived in the provinces of Savo and Karelia. Karelia used to extend further east, but parts of it were lost to Russia in WWII. Lapland is too north for cereal cultivation, and the livelihood used to be based on hunting, fishing and reindeer farming. Modified from the map of Europe by freevectormaps.com. In Eastern Finland kalja used to be the main folk beer, and sahti was mostly unknown. Instead, eastern kalja traditions are related to the cultures of the Baltic region and Eastern Europe. Similar beers include kali or taar in Estonia and kvass in Russia, though today also kvass has been modernized. Lithuanians have their gira and also their baked bread beer keptinis seem to be at least slightly related. Some variants of eastern Finnish kalja resemble boza or bouza, the traditional folk beer still made in the Balkans, Turkey and Egypt. Thus the belt of related ancient beers seem to be stretching from Egypt to North-Eastern Europe. These beers might also be linked to the beers of ancient Mesopotamia and Egypt, though little is known about ancient Sumerian and Egyptian brewing for certain. Eastern Finnish kalja often contained more unmalted grain than malt. There was even a variant called jauhokalja (flour beer), containing nothing but unmalted flour, water and yeast. An old recipe which seems to be fairly typical for eastern Finland included two parts of unmalted rye and one part of rye malt. According to the ethnographical texts the proportion of malt rose towards the west, though also western brewers were using unmalted grains. In Eastern Finland rye was the most common grain for kalja and often filled the whole grain bill. Oats were also common. When barley was used, it was usually malted. Once the heart of an eastern houses was a massive oven used to make lots of casseroles and breads which were big part of the diet. Eastern people brewed kalja much the say way they cooked food using oven and stove. Usually kalja was made once a week mostly with standard cookware . The brewing begun by mixing grains and warm water in a metal or clay cauldron. Then this porridge-like mixture was kept warm for several hours, employing either stove or oven. This so-called sweetening was done until the porridge was darker and tasted sweet. Due to high proportion of unmalted grains and uncontrolled temperatures, the sweetening usually took at least five hours, and an overnight was not unusual. Often the sweetening was finalized by baking the porridge in the oven. The baking was done either in a cauldron or clay pots much like a casserole, or the dough was formed into big breads (made specially for brewing, not for eating) and then baked. Baking was done until crust was brown, which was said to give the ale nice brown color. The sweetening was done in a very concentrated form and the grains were later diluted with water. The simplest method was just pour the porridge into a wooden barrel, add water, let cool, and ferment. Often the ale was fermented with grain solids without any filtering step, similar to the beers of ancient Egypt. The heavier solids fell to the bottom, and the barrels intended for kalja drew the beer from a tap above the dregs. With this method large amount of the beer and sediment were left on bottom of the barrel. As the level of kalja in the barrel dropped, barrel was topped up with water to rinse the sediment. Topping was done several times, until the taste was inferior. The disgust of rinsed kalja have been immortalized into many sayings, such as “like a fifth water on the top of kalja”, describing something really cheap and useless. Usually kalja was fermented with commercial baker’s yeast, yeast harvested from previous batch or with a sourdough starter of the house. Spontaneous fermentation was sometimes used, though less often. Fermentation was typically very short and kalja was ready to drink within a day or two. In the east kalja was made also for feasts, but in more refined manner. More ingredients were used, and perhaps more malts in proportion. A filtering step was often added to strain out grain solids before fermentation. Although daily kalja was never made for alcohol, sometimes the feast version was made slightly alcoholic and intoxicating. As usual, the ethnographical texts describe poorly the actual taste of the old farmhouse kalja. From the texts it is clear that kalja was sometimes tart, sour, or sweet and sour. Fortunately the brewing methods are documented accurately enough, and currently I’m piecing together the methods and recipes to find out how my ancestors brewed and what their kalja tasted like. Damerow, Peter (2012). Sumerian Beer: The Origins of Brewing Technology in Ancient Mesopotamia. Cuneiform Digital Library Journal 2012:2. My first attempt to brew ancient kalja. 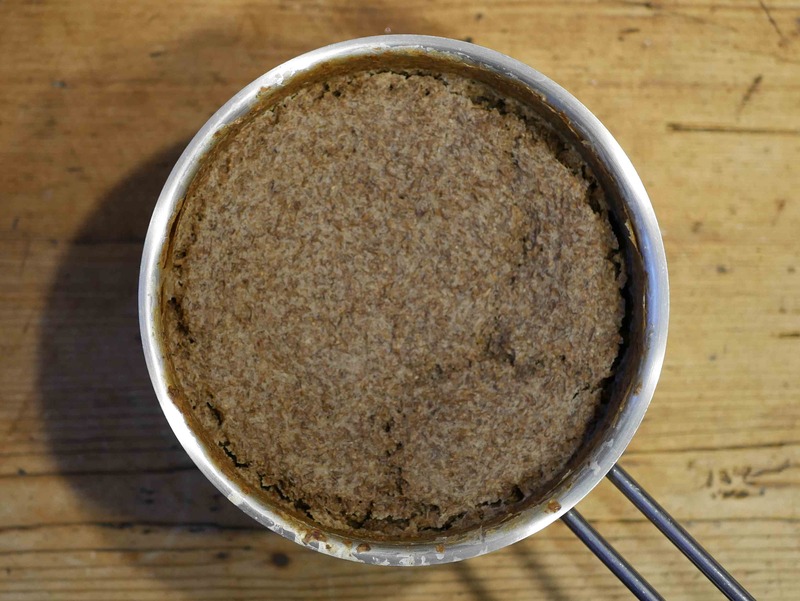 This rye porridge was baked in oven, diluted with water, and fermented with baker’s yeast. The taste was very gruel-like with viscous mouthfeel. It felt very nutritious. I have been looking for information on kalja for years! This has been a great find. I live in Red Lodge Montana which has Traditionally a large Finn population, including my mothers family of Kansala’s and Lampi’s. When I was young our town held an annual Festival of Nations to which Finnish Day was a huge part! One of my fondest memories is drinking the kalja during the evening dancing. I remember it being yeasty, sweet, slightly fizzy and always had plump raisins floating on top! Thanks for finally allowing me to fill in some gaps from over 45 years ago! Thanks Mike, I love to hear stories about traditional drinks that have travelled with people to new places! Because you mentioned raisins, I suspect that the drink you had was sima, a homemade soft drink brewed from water, sugar (white and dark), lemons and raisins. In Finland raisins aren’t usually part of kalja, but it is entirely possible that in Montana kalja was adapted to local ingredients, and hence included raisins. Anyway, both kalja and sima are brewed fairly similarly with simple methods in a kitchen. I should write a story about sima as well.